Today is my daughter's 2nd birthday! so naturally we are having a fairy themed birthday party for her. 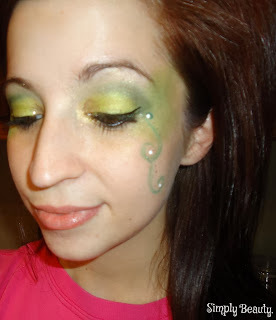 In honor of that, I decided to play around with a fun little Tinkerbell inspired look. This looked much cooler in person than on here. It just looked better, humph. This design was fairy-like to me? but it was just for fun. in the inner corners of my lids too, if you see some weird, dark area in the first picture. That didn't translate well, either. It was fun and whimsical. How would you have done a Tinkerbell look? really cute, i love that you did this for your daughter, happy birthday to her! Happy belated birthday to your daughter! You look super adorable! !